Eat in or take away at Jasmine and choose from a variety of popular Thai food. I recently visited Jasmine for a works xmas party. The food was excellent, great selection and not too spicy unless you want it to be. Will definitely be visiting again with friends. 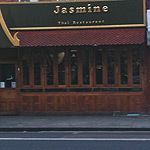 A great neighbourhood restaurant serving authentic Thai fare at reasonable prices, Jasmine is a favourite amongst the locals in West London and beyond. Located on Goldhawk Road, Jasmine is set just off Shepherds Bush Green and is a 5-10 minute walk from the Shepherds Bush or Goldhawk Road tube stations. Off-street parking is also available, although limited. From the outside Jasmine looks small but once inside, the restaurant is surprisingly very spacious. Set in a large dining room, surrounded by traditional artefacts and waiters/waitresses in custom Thai attire, it can’t fail to please. Expect to find locals (or friends of) dining at Jasmine with the restaurant often fully-booked on the weekends. With attentive but not overbearing staff on hand to help with the menu or serve you drinks, you can’t help but have a good time relaxing and enjoying the good food. The starters menu (including fish cakes, satays, and prawn baskets) offers traditional Thai fare like you’d expect in the market stalls of Bangkok – homemade and moreish. Also on the menu are tom yum (spicy seafood) or tom yum goong (chicken and coconut) soups, served as mild or spicy as you request. Move onto the mains and you won’t be disappointed with the duck cooked in red curry, green chicken curry, crispy salmon in red curry sauce, or the ever-traditional Pad Thai - cooked to perfection. Prices are reasonable with starters and soups at £3-6 and mains £7-12. The menu offers quite an extensive wine selection with prices starting from £15 a bottle. Local beers (Singha £3) and non-alcoholic drinks are also available. With reasonable prices and a delicious menu to beat, Jasmine is a W12 treasure the locals like to enjoy or show off to guests. With none of the fancy decorum or pretence, this restaurant rivals some of the (more-expensive) eateries with fancier postcodes.